Book a free consultation to help us work out the best price! The following skin imperfections are superficial which can be treated effectively by Thermocoagulation. The process will improve the skins appearance by reducing or eliminating those unwanted imperfections. 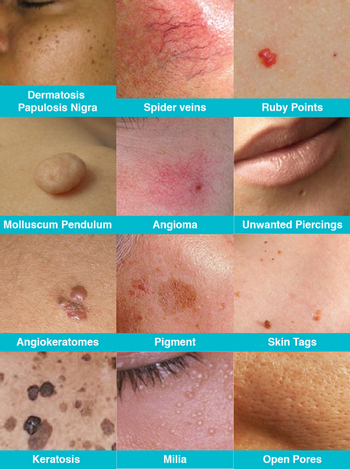 A LHR skin specialist is able to treat: Visible facial veins or capillaries, skin tags, angiomas, milia, keratosis, angiokeratomes, open pores or unwanted piercings. What can we treat with our thermocoagulation device? At The Laser Hair Removal Clinic, we use our new revolutionary Thermocoagulation device that allows our specialists to make use of 13.56 or 27.12Mhz current. This current speed allows for a virtually pain free treatment. The fast speed of the current ensures that the body doesn’t recognise that a treatment is taking place. When compared to other treatments, Thermocoagulation is more precise and directly treats the imperfection which means there is less collateral damage to surrounding tissue and allows for fast healing. Most clients find the sensation is quite gentle and say they feel slight heat and the treatment is virtually pain -free. A numbing agent can be applied prior to treatment to ease the sensation. During a complimentary consultation, our LHR skin expert will explain the procedure, examine your skin and any imperfections and then determine if they can treat you. Our Specialist will determine if the imperfection can be improved with one treatment or if repeated treatments are necessary. Please book a free consultation to help us work out the best price for you. How long before a client sees results? Results are instant. The treatment is very visual, and you will notice the imperfection disappear as they are touched with the probe. This leads to a real “Wow!” response the first time the client looks in a mirror. This is a stark contrast to alternative treatments which can take 6-8 weeks and many sessions. The treatment will remove visible signs of the imperfection and in many cases, it will not recur. There are a wide range of underlying causes to imperfections which may lead to new areas developing. If this happens a follow up or second treatment will clear the imperfection. If there are concerns of recurrence we generally advise a review of the client 8 weeks after the treatment if possible and a yearly review can stop any new areas developing. We are unable to classify our treatment as pain-free as different individuals have varying tolerance levels. We do say that the treatment is virtually pain free. We are regularly told from patients that they hardly feel a thing to the extent that many are unsure when the treatment has started. The revolutionary device allows our specialists to make use of 13.56 or 27.12Mhz current. This current speed allows for a virtually pain free treatment. The fast speed of the current ensures that the body doesn’t recognise that a treatment is taking place. When compared to other treatments, Thermocoagulation is more precise and directly treats the imperfection which means there is less collateral damage to surrounding tissue and allows for fast healing. Most clients find the sensation is quite gentle and say they feel slight heat and the treatment is virtually pain -free. A numbing agent can be applied prior to treatment to ease the sensation. Thermocoagulation compares favourably to other treatment methods which can be very painful and damaging to the client. Any sensation felt by the client during treatment will subside as soon as treatment stops. We are aware that many alternative treatments can leave clients in substantial discomfort for prolonged periods of time.